We have a new guest in the Square. Admire giant painted Snail sculptures as you explore our great city at a snail’s pace! Over the past few months, artists have been transforming their blank snail canvasses into amazing works of art. The sculptures can be found throughout Brighton & Hove, highlighting our city’s historical landmarks, architecture and creativity in our vibrant community. 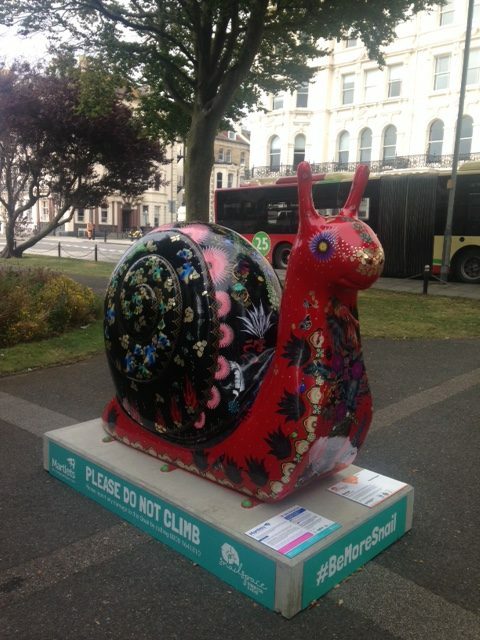 You can download a copy of our Route Map, or pick one up at your local Martlets Charity Shop, and follow The Snailway to discover each and every one of our Snails. Taking inspiration from the pleasure gardens of 18th century, this Snail’s intricate design depicts an array of plants, follies, ponds and half-hidden wonders.Artist Sarah Arnett’s signature style re-imagines fantastical landscapes informed by her love of botany, the bygone world, and a life enriched with adventure and travel. 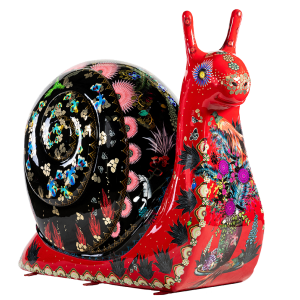 The meaning of the name Soraya is ‘jewel’, and this exquisite snail was created in memory of Arnett’s dear friend Soraya Cotwal-Ray, who shone so brightly and is so very missed. Admire the elegant pattern that adorns Soraya as she sparkles like a piece of treasured jewellery, and follow the paths lit by lanterns to reveal a host of exotic creatures.